Whether you like sports or not, there’s something for everyone to tweet about when it comes to the Super Bowl. From half-time spectacles and clever commercials to suspenseful blackouts, we’re surprised that America’s Twittersphere wasn’t chocked-full of only #SuperBowl tweets. Let’s take a look at this week’s trends and the #hashtags that managed to squeak through the football sieve. Unsurprisingly, the Super Bowl topped the charts in American trends this week. Between the blackout and its influx of ads and comments, Beyonce’s half-time performance (and amazing Hulk-like photographs) and the near comeback, Sunday’s big game had Twitter buzzing. 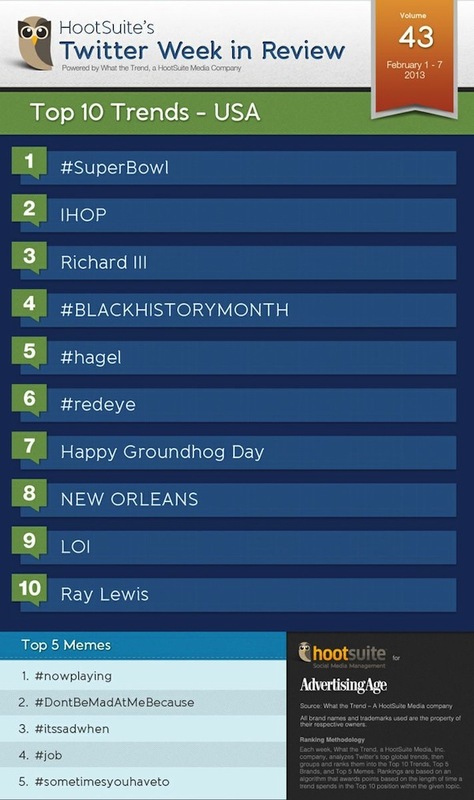 Multiple Super Bowl-related terms trended this past week, but the hashtag #SuperBowl dominated the rest. Super Bowl XLVII’s host, New Orleans also trended for various reasons. Naturally, a 35 minute power outage mid-game caused an instant internet frenzy. And while some showed the host city some love, most football fans questioned the city’s preparations and capabilities for hosting such an event, after the outage fiasco. Seems like New Orlean’s ‘couldn’t handle this’ when Beyonce took the stage – and we all know the Twittersphere takes no prisoners. Ray Lewis, the controversial linebacker who spent his entire 17-year career with the Baltimore Ravens, won the Super Bowl for the second time on Sunday and announced his retirement. Since then, the Raven’s announced their plans to erect a statue of the linebacker outside the M&T Stadium. This decision will be embraced by some and questioned by others, because of his off-field controversies. This week, a piece of a historical puzzle was put into its place. Said to be one of the most significant finds in archeological history, researchers at the University of Leicester, London confirmed this week that the skeletal remains found last year under a parking lot belonged to King Richard III. This confirmation came after DNA tests displayed positive as a direct match to two distant relations of the King. Michael Isben, a Canadian direct descendant of the king’s older sister, Anne of York, is shocked to discover that he is a 17th-generation nephew of the late ruler. Not to mention his help in solving the mystery with DNA tests. Studies of the skeleton found 10 injuries, some from the Battle of Bosworth in 1485, and also displayed his infamous curved spine. Unveiled this week at a news conference held by the Richard III Society was a life-sized plastic model featuring the likeness of King Richard III. This find has stirred historical debates that circulate Richard III, the last Plantagenet King and successions from the House of Tudor to the House of York. Funnily enough, many twitterers believe the society’s model resembles “Shrek” villain Lord Farquaad. In case you were wondering, Plantagenets have nothing to do with plants, apes or planets. In fact, Richard III belongs to the royal dynasty of the House of the Plantegenets, who reigned during the High and Late Middle Ages. While London is busy changing history, America is busy changing children’s lives with pancakes. This week, the restaurant chain IHOP was trending because of their annual free-pancakes-for-charity promotion, also known as “National Pancake Day.” In exchange for free pancakes, IHOP encourages customers to donate to local Children’s Miracle Network hospitals. 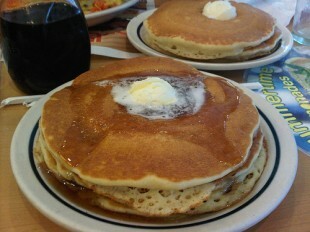 Pancakes for a cause day. Yum. In the US, February is Black History Month, which, as the title suggests an annual celebration of African American culture and history. In 1976, President Gerald R. Ford urged Americans to “seize the opportunity to honor the too-often neglected accomplishments of black Americans in every area of endeavor throughout our history.” That year was the first African American History Month celebration. 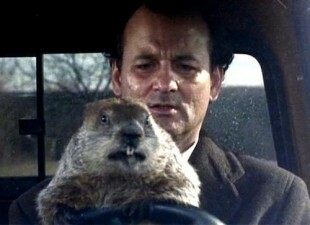 Besides being a great movie, Groundhog Day is celebrated annually on February 2nd. A few famous weathermen, I mean groundhogs, are given the clever task of determining whether we’ll have a short or long winter, which all depends on whether they see their shadow that morning. Perhaps the most famous of the bunch, Pennsylvania’s furry friend, Punxsutawney Phil, did not see his shadow this February 2nd, indicating an early spring. Spring, here we come! Check out what’s trending this week in our International Twittersphere. And as always, until next week friends.